Over the last three years the South Central (Pennsylvania) Task Force Amateur Radio Working Group (SCTF-ARWG) has provided radio communications support for the Integrated Emergency Management Course (IEMC) held at the FEMA Emergency Management Institute (EMI) campus in Emmitsburg, Maryland. The ARWG is a cooperative organization of Amateur Radio groups and individuals involved with emergency communications in the eight county region of Pennsylvania. The group, through its Hospital Emergency Amateur Radio Service (HEARS), also supports emergency communications functions for healthcare facilities in the region. It is charged with coordinating activities and interoperability among Amateur Radio communication assets and organizations. The ARWG participates with ARES® and the Radio Amateur Civil Emergency Service (RACES). "For the IEMC exercise portion, we typically have a voice/data VHF/UHF station in the IEMC's sim cell and each of the simulated EOCs," reports ARWG chairman Don Schmitt, K3DCS. "Our task is to pass exercise injects and handle response messages during a simulated total outage of EOC power, telephone and public safety communications." "Messages are passed using both voice and data modes (fldigi) over amateur service frequencies." staff representatives," said Schmitt. Recently, when a Calhoun County, Alabama EMA brought ARES members along to support exercise communications at the simulated EOCs, members of the ARWG team who are also ARES members (from Adams and York counties, Pennsylvania) assisted them. Pennsylvania state EMA (PEMA) ACS Coordinator Susan Singer, KB3KDC, observes and participates with the SCTF-ARWG team. In the afternoon of Wednesday, December 9th, the northbound lanes of Interstate 5, a major transportation route along the West coast, were blocked by a landslide at mile post 23, just north of Woodland, Washington. Boulders the size of small trucks, mud, and trees invaded all three traffic lanes. Mother Nature did an excellent job of picking a slide location that would create the most chaos as there are no alternate routes in the area, and another slide blocked US Hwy 30 just across the Columbia River in Oregon. Woodland, a tiny community of less than 5,800 residents located at the southern tip of Cowlitz County, was inundated by thousands of unexpected cars and trucks taking exits 21 and 22. Emergency Coordinator Randy Greeley, NU7D put out a heads up email on Wednesday evening, and the Cowlitz County Department of Emergency Management, led by professional Emergency Manager Ernie Schnabler, KB7YPU, activated the ARES portion of its ACS volunteer group on Thursday morning, December 10th. Handling the coordination at Woodland was the Mayor of Woodland, Grover Laseke, KG7O, and Clark County ARES Team 1 Leader Randy Walter, K7LNR. Two shelters were opened for motorists, one by the Red Cross at Grace Community Church on the east side of the freeway, and one at Woodland High School on the west side of the freeway. Walter reported that "Woodland High School canceled school for the day and opened its facilities to stranded travelers with support from its staff." Both shelters, Woodland City Hall, and the Washington State Department of Transportation (at the scene of the slide) were supported by Amateur Radio communications. 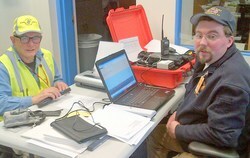 Two VHF repeaters owned by the Lower Columbia Amateur Radio Association were used to facilitate the amateur response. The City of Woodland produced two sets of situation update flyers for posting at local businesses on both sides of the freeway, and the second set was distributed by Dave Bunch, KF7MJQ, and Walter. Other radio amateurs providing communications assistance to the Woodland landslide incident were Bill Czarnecki, KF7ZAT, Carl Gray, K7ECW, Cecil Woolfe, KE7UAN, Colleen Greeley, KB7AYY, Darin Hokanson, KD7TJR, Gordon Spalding, WA6TTR, Jeff Edgecomb, KB7PMO, Jeff Hillendahl, KJ6ETR, Kie Ludwig, KD7UQR, Phil Vanderschaegen, KF7SJK, Ray Blanke, KC7MRM, and Stan Mourning, KF7CVR. One element of the response that could have been improved from the perspective of the stranded motorists was the (non-amateur) communications between Washington and Oregon. Because of the slides on two parallel north-south highways at the same time, northbound motorists on US Hwy 30 in Oregon were redirected to I-5 in Washington, and northbound motorists on I-5 in Washington were redirected to US Hwy 30 in Oregon. "This is a drill, this is only a drill," began Martin County (Florida) ARES' participation in Bio Shield 2015, an exercise that saw teams from the Florida Department of Health in Martin County and local, state and federal partners involved in a preparedness drill to test emergency response. The exercise was held November 3-4, following an air show, which also had ARES participation, in Stuart, a small town on the lower east coast of the Florida peninsula. Soon after the air show ended and pursuant to the exercise scenario, a body was found in a remote airport hangar. According to the scenario, it was determined that the victim had died from the effects of a biological weapon. Other "victims" in the area were showing signs of distress. Thus began the coordinated emergency training drill for Martin County, a three day preplanned exercise for training on, containment of, and otherwise dealing with biologic threats. The drill also involved fire departments, other first responders, police and helicopter support. The Department of Homeland Security (DHS) oversaw the operation. The Federal Bureau of Investigation (FBI) also participated. Martin County ARES assisted with simulated emergency communications. The county fairground was designated as an area for responders to rest, eat and observe the progress of the event. The local American Red Cross facility was staffed by an ARES team, and operators were involved with scenarios involving food, water and bedding distribution there. ARES members were also tasked with coordinating delivery of food, ice and supplies to the fairgrounds for first responders. Participating in Bio Shield 2015 was a first for the Martin County ARES group - their simulated emergency tests are typically based on hurricane situations. The ARES team fielded 17 operators for the county wide biological threat training drill. 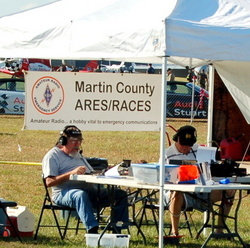 The exercise followed the Stuart Air Show, held on October 30 - November 1, with the Martin County Amateur Radio Association and ARES participating. 50,000 attended this year's event. The air show features reenactments of World War II battles, with paratroopers dropping on to the main display area. The Martin County ARA and ARES operators set up a tri-band antenna on a tower trailer, with the tower raised to 45 feet. Contacts were made with stations around the country and the globe. A special event call sign was employed: N4A - phonetics were "November 4 America." Here are two quotes, which stunned me as much as they should you: "I had no idea what the hams were doing -- they were making decisions that were not theirs to make. ""The hams never integrated." The latter may speak to the former, but these quotes come from two distinct organizations, neither having any connection with the other except for this: negative experiences with our amateur service. These same organizations eventually came back to Amateur Radio, both thanks to a refreshing change in leadership, and with an encouraging constant that held through good times and bad: the quality of our average volunteer. I hear it so often and from every organization and agency: "The hams are dedicated. They show up on time, eager to help. They are our best volunteers." With people like these, why such dissonance? It's a leadership issue, but more than this I believe it comes down to individual relationships and a failure sometimes to recognize, communicate, and maintain boundaries. It's a whole new ball game nowadays. We're not on the scene just to erect a few antennas and check in with net control. Our new roles involve working closer with others, understanding and speaking the language of our "client," doing a lot of communicating long before the event or emergency occurs, and establishing boundaries: Who is responsible for what? How will we handle a particular issue? Who do we report to? Amazingly, time and again, I find these basic questions are never considered by those who allege to lead our teams. It is, I think, the one reason why we sometimes fail. In our Western culture, boundaries are commonly considered in a negative frame of reference, but in the field of human relationships where we do much of our interfacing in Amateur Radio public service, boundaries build trust and confidence and they simply make everything run smoother. I was asked to help organize communications services for a small athletic event. It had the typical closed-course, with water stops, a medical tent, and a loosely constructed set of event leadership. I had reservations: no participation was permitted in the pre-event planning. No integration of our service within the event structure was allowed. We were, I was told, "trusted" to do the right thing. This approach, with its cart before the horse, spelled trouble. Horses don't follow carts very well I thought, and should anything screw up we'll be on the hook. Still, I pitched in and put it together, but with a very cautious approach. Instead of waiting for the rules, I set them myself, and very conservatively. Just before things kicked off I cornered the event official. In friendly fashion I said, "Our job is to provide instant and reliable communications to support safety and extend your decision-making reach, nothing more. This is your event and you make the decisions." I think it was the "nothing more" that stuck, plus the open recognition of and deference to his authority. It opened his eyes, and a few doors. Now, several years doing the same event (we didn't screw up), our roles are expanded, and conversations are finally taking place. I don't recommend this tactic for every event, and I probably would not do it this way again, but perhaps it helps make the point. Boundaries are everywhere and must be considered in how we create a communications plan, what's in the plan, and how it's executed. But plans are only as good as those who follow along. The ARRL Emergency Communications course training reminds us that our role within the EOC, UCC, or any place where we serve others, is to work as a "team player." We are encouraged to take orders (in other words, respect and support boundaries), and to understand that doing so is one of the basic expectations. Things become quickly dysfunctional when a volunteer struts about, insecure and lacking internal controls, inside a group that recognizes the vital link between organization and success; teamwork and individual contribution; working within established channels, consistent with the plan. As a leader, how open are you to understanding, communicating and maintaining boundaries? I encourage you to consider these questions. If uncertain, then ask. If you discover areas of your work that might cross a boundary previously unconsidered, discuss it with those above you in the chain of command. If a volunteer crosses the line, perform rapid correction, then improve training, and refine your volunteer selection, screening, and assignment. Above all, make it your goal as a leader to listen, and to approach your bosses and your teams with a relationship-opening attitude. Replacing "here's what I will do for you" with the simple question "how may we be of service?" goes a long, long way. [I recently asked ARRL South Carolina Section Manager Marc Tarplee, N4UFP, if there was any significant response to this fall's flooding disaster there. A storm that resulted from a cold front that passed through the eastern US, stalling offshore and picking up moisture from Hurricane Joaquin, caused the devastating flash flooding from rain, and rivers overflowing banks that resulted in much destruction. Here is his reply -- ed.] ARES activity in South Carolina during the historic flash flooding in October was minimal, but the state's Emergency Management Division did have a group of Amateur Radio operators activate the amateur position at the state EOC continuously during the storm and during the immediate aftermath. Normal telecommunications infrastructure remained almost completely intact during the entire event. The rain came, quite literally, without weather. It rained continuously for an entire weekend, but there was no wind, no electrical activity, no hail, and no tornadoes. The rain was not a deluge, just steady and unrelenting. The major flooding affected an area bounded by Myrtle Beach, Columbia, and Charleston, roughly one-third of the state's land area. The remainder of the state did not experience any real flooding, just unending rain. The Disaster Resistant Communities Group provides disaster planning and preparedness, response, recovery and mitigation services to local, regional, state and national agencies and departments as well as community and faith based organizations. According to its website, the DRCG "develops innovative concepts that meet the needs of local, state, regional and national emergency management agencies and organizations; and provides creative opportunities for local community stakeholders to plan and prepare for, respond to, recover from and mitigate the effects of disasters and to use innovative technology that engages people, organizations and agencies to work together to prepare the whole community for the next emergency or disaster." Northern Florida's West Panhandle District ARES supported the Cottonmouth 100 Ultra-marathon, a 100-mile endurance race that ran through parts of two counties (Santa Rosa and Okaloosa) in a forest that encompasses almost 200,000 acres. Amateurs provided radio support at each of six aid stations and the start/finish line. Eight Escambia County ARES members, one Okaloosa County ARES member, and six Santa Rosa County ARES members all worked together to pull off the operation. A net control station conducted the race net on two frequencies -- 146.430 MHz simplex and 147.360 MHz, the W4AAZ Crestview repeater. The goal was to use simplex as much as possible and only use the repeater for those aid stations that could not otherwise be heard. The competitors ran on several portions of the Florida Trail. The race began at 6:03 AM on November 14. ARES support kicked in after the first 50 miles had been completed by the runners. The net control station started radio operations at noon, continuing operations until 11:00 the next day. Tactical call signs consisting of the name of each aid station were used. Each aid station reported each runner's number as they came through. A large portion of the race was in darkness, so reporting was critical for safety. More operators were needed, as were a backup net control station and message runners at the net control site. A spreadsheet (in lieu of scratch sheets) for each radio operator listing each runner and bib number would have improved tracking efficiency. Antennas for each station could have been higher. Shelter for the operators for protection from the elements (primarily cold and dampness) needs improvement. Preparations are underway once more for the Boston Athletic Association's Boston Marathon, April 18, 2016. Nearly 300 trained Amateur Radio volunteers support the event, providing vital communications services across the entirety of the 26 mile course. Volunteers are recruited, selected, and managed by the BAA's Communications Committee, which is entering its second year of operation. "A major initiative of the Committee this year is to bolster the technology we use on Marathon Monday," said Communications Committee member Matthew Forman, K6MCF. "To do so, we're forming a Technical Infrastructure Subcommittee (TIS) and seeking amateurs who can offer current skills in analog and/or digital modes (UHF/VHF), repeaters, and infrastructure. We'd like to have the TIS consist of one technically-seasoned member from Amateur Radio clubs in Massachusetts, southern New Hampshire, and the northern parts of Connecticut and Rhode Island," said Forman. Another Committee member, Mark Richards, K1MGY, will be assisting in representing the TIS to clubs and other interests. "A diversity of talent, and the involvement from and representation to this work by area clubs is vital to creating volunteer opportunities for everyone and making sure that Amateur Radio is a part of this extraordinary event for years to come," he said. Richards will be contacting clubs and soliciting their assistance. He can be reached directly at k1mgy@hamradioboston.org. The Department of Homeland Security's Office of Emergency Communications (OEC) will be on hand at Orlando's HamCation® 2016, the ARRL National Convention, to conduct its nationally recognized NIMS/ICS compliant Auxiliary Communications (AuxComm) course. Over 1,200 Amateur Radio operators from around the country have taken this course. The purpose of the course is to train qualified amateurs so they may assist their local, county and state governments with emergency backup communications if requested to do so. This course will be held the three days prior to Orlando's HamCation®, February 9-11, in the Orlando, Florida, area near the Hamcation event site. Only students whose registration is approved in advance will be allowed to attend this training. The course is limited to 40 students, and registration will close when that number of qualified students has been reached. OEC will notify Statewide Interoperability Coordinators (SWIC) in those States whose attendees successfully complete this training. This will be an intensive three day course with facilitated lectures and student exercises. This course provides time for interactive discussions and exercises. Registrations/questions regarding this course should be sent to:OEC@hq.dhs.gov with the key word "Orlando HamCation 2016" in the subject line. What's your New Year's Amateur Radio resolution? Send it to me at k1ce@arrl.net and I'll publish the best ones! Happy Holidays and Happy New Year from your editor -- Rick Palm, K1CE, Daytona Beach, Florida -- "The World's Most Famous Beach"